Do you still remember the popular Jordan Team Elite from Jordan Brand that became so popular before? Jordan Brand is looking to make another noise this year with the release of a new colourway of the third installment of the Jordan Team Elite, the Jordan TE 3 Low. The impressive-looking Jordan TE 3 Low will be released in White/Metallic Silver colourway this month, which arguably looks fresher than the one released last month. 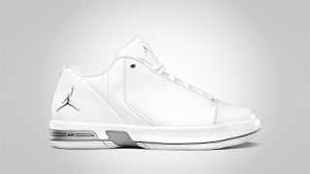 This shoe features a white upper part accented with metallic silver midsole and Jumpman logo. If you are looking to buy a top-class shoe this month, watch out for this one and you will never regret buying it!